Hey all, happy Monday. I have been on and off blogging nowadays, the kiddos were off school, and was busy with some errands. I am trying to visit your blogs, hopefully will do it slowly, there are so many I have missed. I am up with a card, inspired by the summer colors I see nowadays, all the flora and fauna is blooming and booming, so its greenery and flowers everywhere I see from my house. My card is inspired by this. 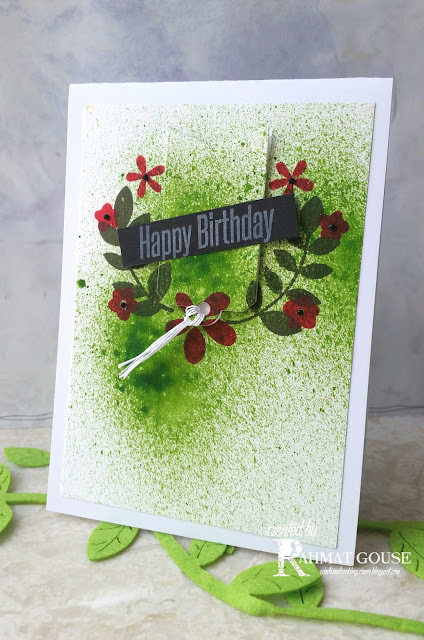 I started with spraying a water color paper with mowed lawn distress ink spray, and then I used Paper Smooches - botanicals to stamp in olive green from Momento and a red ink. 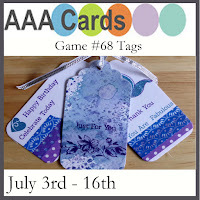 Once done with the stamping, I used Avery Elle Tag die and die cut the tag, and glued the front to a white base, and for the tag I used foam adhesive. I added a white floss to the tag, and black jewels to the flower centers. The sentiment is from HLS - mix mash set. Hiii! So glad to see you play at SOS! (Your work is always inspiring!) This card is so unique-- that inverted tag is so cool with the modern font of the sentiment. Have a great day! I am loving your sprayed background - it looks amazing! And the tiny flowers and leaves look beautiful! Lovely card, Rahmat! Such an unusual idea to have the tag upside down and it works so brilliantly. Gorgeous background too. Thanks for playing at AAA Cards. Hello Rahmat: I'm blown away by this card, I love the gorgeous spray of green color, it looks amazing. Love the jewels in the little flowers too, awesome detail. Thank you for playing with our Shopping Our Stash challenge, hope to see you back in the gallery again soon. Beautiful work! Thanks so much for sharing with us at Shopping Our Stash! Rahmat, your card is just beautiful. Love th cool effect your background splattering creates. It seems I can smell grass, it looks so fresh! Perfect combination of colors and texture. Beautiful take on the sketch! I love the ink spatters! Fabulous card, I camouflaged my tag also. thanks for playing with us at AAA Cards! Thanks for joing our challenge at Creative with Stamps!